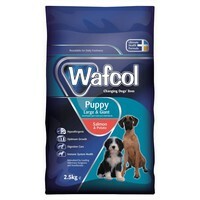 Wafcol Puppy Salmon and Potato Food for Large and Giant Breed Puppies is a highly palatable and nutritious food that has been formulated for optimum growth and development. This tasty puppy food contains prebiotics which are proven to help improve digestion. It is also a hypoallergenic, using salmon and the single source of protein and potato as the main source of carbohydrates. It has been formulated with no cereals such as wheat gluten, maize, barley, rye, oats, red meat, poultry, dairy products, soya, artificial flavours and colourings. By feeding a hypoallergenic food, your puppy will not be exposed to many allergens and lowers the risk of symptoms developing in later life. Puppies need approximately twice the amount of energy per unit of body weight as an adult dog of the same breed, making feeding your puppy the correct diet at this important stage essential. Not only does Wafcol Puppy food taste great but it also contains all the essential nutrients for a fundamental growth phase, giving your puppy the best start in life. Crude Protwin 26%, Fat Content 12%, Crude Fibres 3%, Crude Ash 8.5%, Calcium 1.1%, Phosphorous 0.9%, Omega-3 Fatty Acids 1.6%, Omega-6 Fatty Acids 2.7%.